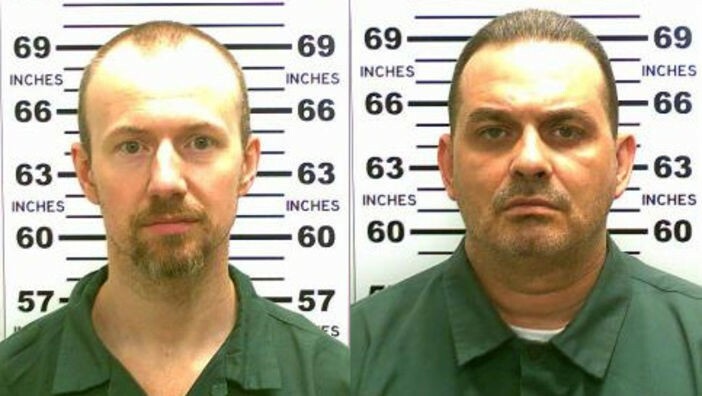 David Sweat, left, and Richard Matt, right. Two convicted killers who escaped from a high-security prison in upstate New York five days ago may have been headed to Vermont, officials said. During a Wednesday afternoon press conference featuring Vermont Gov. Peter Shumlin, New York Gov. Andrew Cuomo and top law enforcement officials from both states, officials revealed that inmates discussed fleeing to a camp in Vermont. Police stressed that there has been no sighting of David Sweat and Richard Matt in Vermont, and that they are following numerous leads. On Wednesday alone, authorities said, they received 500 tips. "We have information that suggests New York was going to be hot; Vermont would be cooler and that a camp in Vermont would be better than New York," Shumlin said at a press conference in Dannemora, N.Y., near the Clinton Correctional Facility. More than 450 law enforcement officials are hunting for Sweat, 34, and Matt, 48. The men were discovered missing during a 5:30 a.m. bed check on Saturday. Authorities say they executed an elaborate escape plan that included cutting through metal pipes and walls using power tools. Vermont State Police said they have been monitoring travel routes into the state since Saturday. They have taken other steps, including assigning a trooper to work at the command post in New York, disseminating flyers at Vermont campgrounds, deploying a marine team on Lake Champlain and keeping a tactical team on high alert. "The Vermont State Police will do everything in its power to protect Vermonters' lives and property, and assist New York authorities in the safe apprehension of these two escapees," Vermont State Police spokesman Scott Waterman said. "If you have any information that could lead to the location or capture of these individuals, call 911 immediately." Cuomo called Shumlin Wednesday morning and notified him of the possible Vermont connection, the governors said. WCAX-TV reported that the Coast Guard in Burlington has participated in the search on the New York side of Lake Champlain, but is now in "standby mode." Officials have offered a $100,000 reward for information leading to the fugitives' arrests. Police urged the public to not approach the men, and call police. Sweat is serving a sentence of life without parole for killing a New York sheriff's deputy in 2002. Matt is serving a sentence of 25 years to life for kidnapping and beating a man to death in 1997.